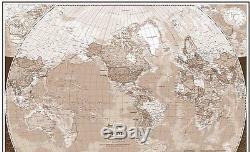 World Map (French Version) in Sepia 12' x 8' (3,66m x 2,44m). Wallpaper mural of a world map (french version) in sepia. Measures 12' (3,66m) wide by 8' (2,44m) high. The mural is made of 8 strips of 18 (45cm) wide by 8' (2,44m) high. Prepasted, washable, dry strippable and reusable wallpaper mural. Can also be viewed on YouTube for step by step installation. Professional Installation available in Ontario(Canada). Step 1 - Tools required. A small step ladder, a water tray, an exactor knife, a straight edge, a level, a sponge smoother, a tape measure and a pencil. You probably have most of these tools already. Water trays and sponge smoothers are available in all good hardware stores. Step 2 - Wall preparation. Surface should be clean and smooth. Large cracks should be repaired but nail holes will not show. IDEALLY, a wall covering primer will ensure proper adhesion and future removal. It is normally transparent and it dries in 30 minutes. You can install the mural directly over latex paint. DO NOT install over fresh latex paint. Wait at least 3 weeks for latex paint to cure. You can install a mural over oil based paint. If the oil based paint is high gloss or semi-gloss, just lightly and quickly sand the surface (#80 sand paper) before hanging. It will improve the adhesion. Step 3 - The Mural. The mural comes in a robust plastic tube and packaged in the cardboard box. The mural is made of a blend of paper fibers and synthetic fibers. There is NO VINYL (PVC) in our murals. The synthetic fibers make the substrate stronger and makes it 100% dry strippable and reusable. For instance a 10.5 feet mural will come on one roll of 7 panels of 18 wide printed one after the other on the roll. There is a white gap of 1 to 2 inches between each panel that you separate with a pair of scissors or an exactor knife. The last panel comes first. If you want to install your mural from left to right, you will have to separate all your panels first. Step 4 - Where do we start? Measure the length of your wall and compare to the length of your mural. Each panel is 18 inches wide. For instance if the mural is 10 inches larger than the wall, you may decide to trim 5 inches from the first panel and 5 inches from the last panel. In this case, draw a light vertical line with a pencil at 13 inches (18-5) from the left of the wall using a level. If the mural is shorter than the wall say by 10 inches, then 5 inches should be left on the left and on the right of the wall. Draw a vertical line at 23 inches (18+5) from the left of the wall. In that case, you may want to frame your mural with a wood moulding around the edges for a better finish. Step 5 - Installing the first panel. 2 Measure the height of the baseboard. Use half of that height for trimming at the top and the other half for the bottom. You can cut less at the top or at the bottom for a better visual effect, but make sure you leave a minimum of one inch at the top and at the bottom in case your ceiling or floor is not perfectly level. If you are tempted to install the entire first panel right against the left or right wall, you can do it under 2 conditions. 1- Make sure the left or right wall is perfectly level. 2- Take the panel without wetting it and install it temporarily against the wall making sure that your panel covers the corner well and that is still level. Good installers will always waste one inch by drawing a leveled line at 17 inches from the wall. If you wall is not perfectly straight, the corner cut you will make to remove the excess inch will correct any corner imperfections. Fill the water tray with clean lukewarm water and place it against the wall. Roll the first panel starting at the bottom with the print inside (back of the paper outside). Submerge in water tray for 15 seconds. Then, very slowly, pull the panel out of water, making sure the backing is completely wet and hang the right side against the vertical line you drew earlier (use a step ladder to be able to pull the strip to the top of the wall). Gently smooth outwards from the center of the panels to the sides, removing air bubbles. Avoid overworking the edges and stretching. If new air bubbles develop after smoothing them out, don't worry, they will disappear after a few hours. Trim top and bottom as required with an exactor knife, changing blades frequently to avoid tearing the fabric. Use a straight edge, like a metal cutting guide or a ruler as a guide. At the top, cut with the knife over the guide. At the bottom, cut with the knife under the guide. Use the corner of the wall and the metal cutting blade as a guide to cut the excess on the adjacent wall. Step 6 - Install the other panels. Repeat this procedure for remaining panels. IMPORTANT: The panels are designed to be overlapped by 1/4"(60 mm) the last 1/4"(60 mm) on the right of each panel is identical to the first 1/4(60 mm) on the left of the next panel. Match the design at eyes level first , then do the top and the bottom. Do not hesitate to remove the panel and reposition it if you have difficulty finding the match. After hanging all panels, use a clean damp cloth and run it firmly over the seams to remove excess paste. Dear-This is just a quick message to say that the mural we ordered arrived safely. Also we are delighted with the product and the effect. The installation instructions available from your website were excellent, also. Thank you for your prompt service. It is amazing to think that we were able to order your product from the other side of the world. We are pleased to tell all the admirers that the mural has come from Canada. Many thanks and kind regards from Eric & Daphne Wells, Willeton, Australia. Our mural arrived in perfect condition. I did read the instructions, however, even though I put the first piece at the wrong end, discovering this only after I tried to apply the second panel (which was now wet), I was able to remove and reposition the first piece. It held in place perfectly, aligned the second panel and then carried on. I installed it all, including the trim, in about an hour. What a difference, visitors coming in to inspect the work actually had to touch it, because it does look like it was painted on the wall. The'graphite chaulk' trick for the dark edges worked great at hiding any white edges. Hi, We put up the mural today. It went up easily and is nice to work with. Thank you again for your good service. Suzanne Van der molan, Lauceston, Tasmania, Australia. Hi, I ordered'Breakaway' for my son's play room... And we just installed it. Thank you so much for the terrific product. It is worth every penny. My 4 year old absolutely loces it. Thanks Crystal Lachance, West St-Paul, Manitoba. I had to let you know how absolutely thrilled we are with your product. We met you at the Toronto Home Show this year and ordered your'Bird's Tree' mural for our daughter's new room almost immediately. We were very pleased that it arrived so quickly. We finally got the painting and carpeting done and decided it was time to try our hand at installing this beautiful piece of art. We were very nervous as we had never done anything like this before. We are very happy to report that the installation was as easy as you said it would be. The product was very easy to work with. We had it up and looking perfect (if we do say so ourselves) within a couple of hours. Our daughter has already started naming the little'birdies'. Thank you so very much for your fantastic service and for a wonderful addition to our home. Linda and Paul Nolan Scarborough, Ontario. Since our 6 year old son was adopted from China 3 years ago, we wanted to decorate his room in an Asian theme and when we saw your mural, we knew that this was the one for us. We ordered it on a Tuesday, and it arrived at our front door on Thursday. It was so easy to install and it took us only 2 hours from start to finish and we have no experience in hanging wallpaper. Thank you sooooo much for such an outstanding quality mural and we highly recommend you to everyone... You may use us as a references if you want. The Jill and Warren McBeath Ottawa, Ontario. Dear Pierre, We recently bought the mural "Old Macdonald has a farm". And the high quality of your product. As well, your mural was very easy to install. We installed the mural in the new playroom of our daughter, Lorie. Her expression when she first saw the mural was worth all the gold on earth! At 21 months, our daughter adores her new world thanks to your magnificent mural. She is so taken by the colours, that she has lined up all of her teddy bears and dolls in front of the mural. We have enclosed some photos. Mélanie Côté, Éric Cabana & Lorie Cabana, Otterburn Park, Québec. Dear Pierre, We must say to you how satisfied we are with the custom -made mural that you printed for us from our photo , taken in Egypt in front of the pyramids. We very much doubted that this project would work due to the quality of our photo. We are so pleased with the results; you have created a miracle! We hung our mural without any problems, the pre-pasted paper was of high quality and the directions were clear and precise. We have almost finished the decoration in our room, complete with Egyptian artifacts. We have been telling all our friends about your company. André et Brigitte Massias de Lockemeau, Côtes d'Armor, France. Alberta, Saskatchewan, Quebec, Prince Edward Island, and the Territories - 5%. British Columbia and Manitoba - 12%. New Brunswick, Newfoundland, and Ontario - 13%. 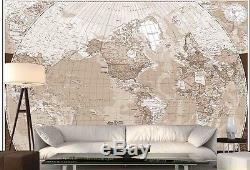 The item "World Map (French Version) in Sepia 12' x 8' (3,66m x 2,44m)-Wall Mural" is in sale since Saturday, March 18, 2017. This item is in the category "Home & Garden\Home Improvement\Building & Hardware\Wallpaper & Accessories\Wallpaper Murals". The seller is "uniquemural" and is located in Mississauga, Ontario. This item can be shipped worldwide.